Mario Paint is an art game that requires the SNES Mouse peripheral. Drawing Board offers 15 colours, 75 texture patterns and 120 stamps. You can sketch with tools such as pens, airbrushes and shapes, and custom stamps can be created using pixel art on a 16x16 grid. While the mouse isn't as accurate as modern optical devices, it still works well and allows for a decent amount of precision. The tools are plentiful too and provide lots of ways to construct your masterpiece. One neat addition is a pre-drawn colouring book, but the most enjoyable feature is pixel art creation, as its simplistic nature isn't overwhelming for the artistically challenged like myself! In Music Composition you build songs using 15 sound effects and loops. It's a good way of teaching basic music notation but the clever part is that it uses familiar icons rather than complicated notes. There's plenty of fun to be had, especially when you start adding in random cow noises! Animation mode gives you four, six or nine frames to work with. Drawings can be copied to new cells and the speed of movement can also be controlled. It's basic, but I love that you can overlay them onto your existing artwork, and simultaneously play tracks created in the Music Composition mode! Best of all, a Save/Load feature is available to backup everything you've done. Gnat Attack is a mini-game where you swat insects before they sting your hand; once you've swatted 100 you face King Watinga. Like Kaboom (1981, Atari 2600) it pushes your reactions to the limit and the lack of a traditional controller makes twitch-style movements much easier. It's highly addictive and strategising attacks around enemy patterns is a real joy. 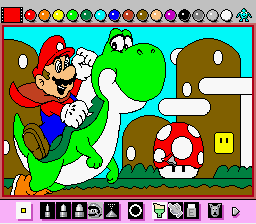 Mario Paint is undoubtedly basic by today's standards but it has that classic Nintendo charm and tons of content to sink your teeth into. It's very accommodating to newcomers, and even if you don't find yourself enamoured with the artistic side of the game there's still the awesome Gnat Attack to provide some Arcade-style fun! Random trivia: Gnat Attack was later reused in WarioWare, Inc.: Minigame Mania (2003, Game Boy Advance).